Research surrounding immunotherapy is a hot scientific area, as scientists and physicians try to find a way to get the body to fight cancer by itself, eliminating the need for costly and painful techniques such as chemotherapy and radiation. In effect, immunotherapy pursues the age-old medical dream of allowing the body to be its own physician. The winners in the immunotherapy space will prove superb long-term investments. One immunotherapy player that’s recently garnered a lot of attention on Wall Street is Celldex Therapeutics (NSDQ: CLDX). As a small-cap biotechnology company, Celldex could be a potential “rocket stock” ready to blast off. But it could also blow up on the launch pad. That’s the dilemma with biotechs, especially thinly capitalized stocks such as Celldex. Outsized potential comes with outsized risk. Is Celldex worth the ride? Let’s roll up our sleeves and find out. Based in Hampton, New Jersey, Celldex Therapeutics develops and markets immunotherapy technologies and other cancer-targeting biologics. With a market cap of $44.4 million, Celldex has several drug candidates in the pipeline. These treatments include glembatumumab vedotin, an antibody-drug that is in Phase IIb study for the treatment of breast cancer and a Phase II study for the treatment of metastatic melanoma; Varlilumab, an immune antibody that is in a Phase 1 study designed to boost a patient’s immune response against cancer; and CDX-3379, a human monoclonal antibody that is in Phase II study for the treatment of head and neck squamous cell carcinoma. In 2017, Celldex fell 21.3% compared to a gain of 19.4% for the S&P 500. In 2018 year to date, Celldex has fallen 91.1%, compared to a decline of 1.6% for the S&P 500. With a market cap of $126.7 billion, Abbott Laboratories is one of the world’s largest producers of prescription drugs, diagnostic tests and vision care products. Abbott operates across four business segments: Branded Generics, Medical Devices, Diagnostics, and Nutrition. These businesses provide a diversified customer base and payer mix. The company’s drug portfolio includes Humira, for rheumatoid arthritis, psoriatic arthritis, Crohn’s disease, and psoriasis; Norvir, for HIV; Depakote, an anticonvulsant; and Synthroid, a synthetic thyroid hormone. Based in Abbott Park, Illinois, Abbott offers a wide range of medical devices and diagnostic tests used worldwide by doctor’s offices, hospitals, laboratories, and blood banks to diagnose, monitor and treat diseases such as cancer, HIV, hepatitis, heart failure and metabolic disorders. Israel-based Teva is the world’s biggest manufacturer and marketer of generic drugs. The company also develops patented biologic treatments, which are derived from humans, animals or microorganisms. Biologics can be composed of proteins, sugars, or living cells and tissues. Biologic drugs are crucial in cancer research and treatment, but many have either already lost or stand on the verge of losing patent protection. This is paving the way for “biosimilars,” which are generic, less expensive copies of biologics. With a market cap of $19.3 billion, Teva stands in the forefront of biosimilar research and development. The company is readying several new gene-based biosimilar drugs for market and is on the cusp of dominating this space. Teva also owns a global patent portfolio of more than 1,000 molecules. The company’s biggest selling products include Copaxone for the treatment of multiple sclerosis; Provigil and Nuvigil for narcolepsy and other sleep disorders; and Azilect for Parkinson’s disease. With a market cap of $131.9 billion, AbbVie boasts a diverse portfolio of top-selling drugs. ABBV also is a leader in developing immunology treatments and it offers the blockbuster-selling immunological drug Humira, which is used in the treatment of rheumatoid arthritis, chronic plaque psoriasis, Crohn’s disease, and arthritis. In addition to Humira, AbbVie also offers Imbruvica, an oral therapy for the treatment of chronic lymphocytic leukemia, and Viekira Pak, for the treatment chronic hepatitis. AbbVie is the result of a spinoff launched by Abbott Laboratories in January 2013. The new AbbVie entity assumed control of brands such as Humira and Synthroid, a replacement for a hormone normally produced by the thyroid gland. Abbott retained diagnostics, medical devices, nutrition and branded generic pharmaceuticals. Will Celldex Go Up In 2019 (Should You Buy)? One of the surest ways to make profits is to tap into macrotrends that enjoy multi-year momentum. That description fits Celldex and its focus on immunology treatments. Immunotherapy involves the use of the human body’s immune system components to treat a disease or disorder, typically cancer. This treatment can complement but often supplants chemotherapy and radiotherapy, both of which entail unpleasant side effects. Oncologists, the physicians who study, diagnose, and treat cancerous tumors, believe that the most powerful weapons now available in the war on cancer are immunological. This trend positions the right companies for a “biotech bonanza” ahead. Cancer cells produce antigens, or “biomarkers” that are recognizable by the immune system but which can go undetected during chemotherapy, limiting chemotherapy’s overall efficacy as a tool against cancer. For the most part, chemotherapy, akin to radiation, doesn’t fully distinguish between the “good guys” (self cells) and the “bad guys” (non-self cells). Therefore, chemo-radiation has the potential to affect the whole body, sometimes killing everything equally. It’s increasingly apparent that what’s needed in this war to overtake cancer is to design a cancer drug that stimulates the induction of antigens, the soldiers of the immune system, to recognize and destroy cancer cells. As testament to its growing importance, immunology is increasingly in the news. Sean Parker, the “bad boy” of Silicon Valley, promised $250 million of his own money to fight cancer. The ramifications for biotechnology investors are huge, especially for smaller entrepreneurial outfits such as Celldex. The multi-billionaire co-founder of Napster and former president of Facebook (NSDQ: FB) donated $250 million, which is about 10% of his estimated net worth of $3 billion, towards the creation of the Parker Institute for Cancer Immunotherapy. The institute will focus on the development of breakthrough immune therapies to fight cancer cells. Parker’s institute should kick-start immunotherapy growth in general, rebounding to the benefit of companies in the field. Recent data provides empirical proof of immunotherapy’s increasing efficacy. One of immunotherapy’s most notable success stories is former President Jimmy Carter, who in 2015 was diagnosed with advanced melanoma that had spread to his brain. Carter’s treatment with a new immunotherapy drug in combination with radiology eliminated his tumors. With these developments in the works, makers of immunotherapy drugs such as Celldex are poised for a new wave of growth. Will Celldex Go Down In 2019 (Should You Sell)? Celldex has racked up a string of quarterly earnings losses and revenue declines. Celldex’s total revenue came in at $0.9 million in the third quarter of 2018 and $7.8 million for the nine months ended September 30, 2018, compared to $3.9 million and $9.3 million for the comparable periods in 2017. Celldex’s net loss was $7.2 million, or ($0.04) per share, for the third quarter of 2018, and $141.8 million, or ($0.94) per share, for the nine months ended September 30, 2018, compared to a net loss of $26.4 million, or ($0.20) per share, for the third quarter of 2017 and $89.2 million, or ($0.71) per share, for the nine months ended September 30, 2017. This poor level of operating performance could continue in 2019. Celldex is a pure play on immunology, a field that’s in the vanguard of cancer research. The company is highly risky and not suitable for conservative investors. But if you have a strong stomach for volatility and you’re seeking outsized gains, the stock could be for you. The pressure for drug companies to find untapped growth opportunities is fierce, compelling companies to pursue immunology drugs for the treatment of cancer patients who are failing to respond to existing conventional therapies. A flood of patent expirations continues to shake up the drug industry, spawning consolidation among the biggest players as they seek economies of scale. The future winners will be research-intensive companies with the strongest drug development pipelines and the most innovative treatments. A small biotechnology stock such as Celldex has more risk than, say, a large-cap biotech such as Abbott Labs, but the upside potential is far greater. With leading-edge immunology treatments in development, this small company should tap long-term growth while its peers struggle with the headwinds of patent expirations and government cost-containment. 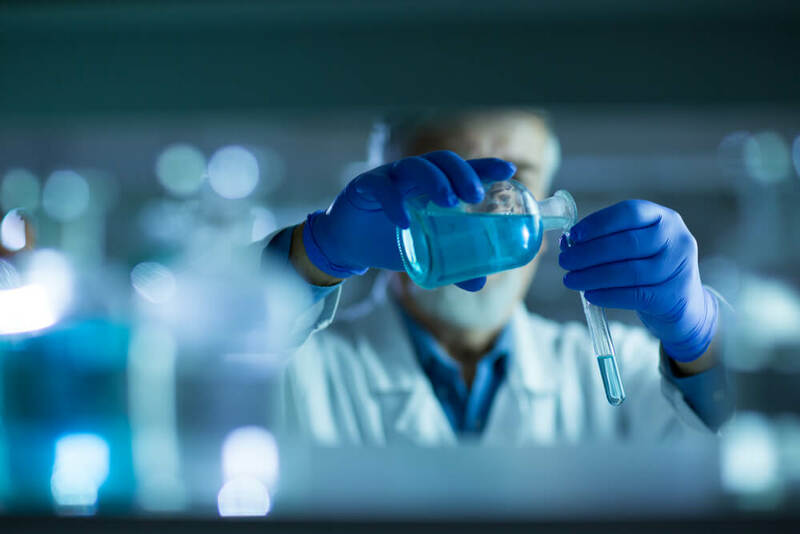 In the first quarter of 2019, Celldex expects to announce results from the initial part of a Phase II study of its cancer drug CDX-3379. If results are positive, the stock is likely to hit the stratosphere. It’s also likely that Celldex will initiate a reverse stock split in early 2019. The move would reduce the number of shares outstanding and lift the stock price above the Nasdaq’s minimum bid price of $1 per share, so the stock can keep its listing on the exchange. Celldex’s share price currently hovers at around 26 cents. On average, analysts expect the share price to reach $4.50 within 12 months, for a whopping gain of more than 1,630%. That’s nothing to sneeze at.